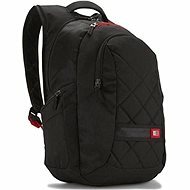 The 16" Checkpoint Friendly Laptop Backpack from Case Logic has dedicated pockets for a 15-16" laptop and either an iPad or 10.1" tablet. The pack is divided in half, butterfly style, with a zipper separating the two halves. Your laptop is held in one half and the iPad in a slip-in pocket in the other half. This pack is also CheckPoint Friendly since it means your laptop may not need to be removed when you pass through airport security. In addition, the Grab 'N' Go design allows you to exit security without having to re-zip the case. The bottom of the pack has a grab handle that helps you quickly remove your pack from the security belt. A full-size zippered document pocket is provided for your files and collateral material. The front of the pack has an organizer panel for small electronics, pens, a notepad, a USB cable and a key ring. The pack is carried by adjustable backpack straps or top and bottom grab handles. There's a rear trolley sleeve that allows you to toss your pack over your optional rolling luggage cart. 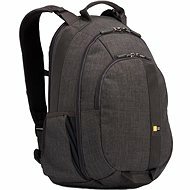 The pack is made from 1680D ballistic and high-density 900D nylon. 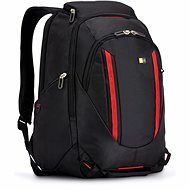 Notebooks up to 16 "
For shipping to other EU countries visit this page Case Logic 16" Laptop Backpack. Für Versand nach Deutschland, besuchen Sie bitte Case Logic ZLB216 16 ". Chcete doručit zboží do Česka? Prohlédněte si Case Logic ZLB216 do 16". Chcete doručiť tovar na Slovensko? Prezrite si Case Logic ZLB216 do 16". Für Versand nach Österreich, besuchen Sie bitte Case Logic ZLB216 16 ". Magyarországra történő kiszállításért tekintse meg ezt a termékoldalt: Case Logic ZLB216 16".